Last week, the state released data from a statewide survey of students in grades 6, 8, 10, and 12. The students voluntarily answer questions regarding their health behaviors. The data is used to guide policymaking, funding, and program changes at the state and local levels. OLYMPIA—March 28, 2019—Plans for suicide. No one to turn to for help. Disconnect between schoolwork and life goals. Sexual assault. Bullying. Each day, students across the state go through these experiences and emotions. And each year, the number of students with these experiences increases. 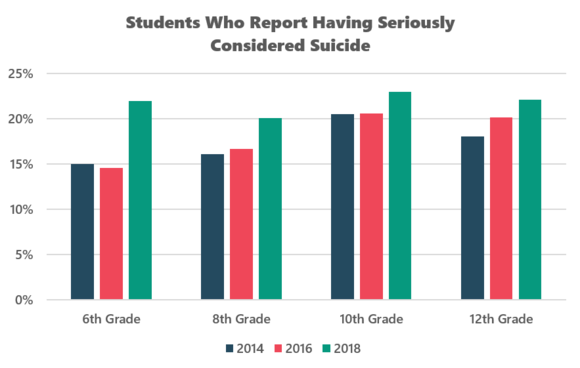 In 2018, students at the grade levels surveyed reported higher rates of having seriously considered suicide than was reported in 2016. In addition, only about half of students in grades 8, 10, and 12 report having an adult to turn to when they feel sad or hopeless. In addition, in 2014, 2016, and 2018, about 1 in 5 high school students reported being bullied at school. For students in grades 6 and 8, it was nearly 1 in 3. When asked if they have had contact with a counselor at school within the last year, over half of 8th grade students and nearly half of 10th grade students said they did not. 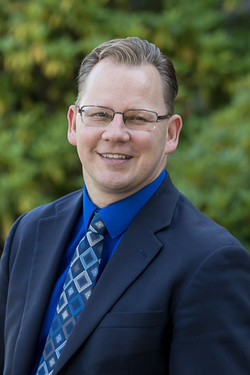 To help combat this, the Office of Superintendent of Public Instruction (OSPI) has proposed the Legislature increase the number of middle school counselors and create a coordinated statewide suicide prevention and behavioral health system. Students also reported not feeling connected to their coursework. The percentage of students in 8th grade who reported feeling like their coursework is not often meaningful increased by nearly 8 percent since 2014 (from approximately 15 percent to 22 percent). For students in 10th grade, the number has climbed to almost 30 percent. This legislative session, OSPI proposed multiple ways to provide options to students. This includes increased access to career and technical education courses, as well as dual credit expansion, where students earn both high school and college credit at the same time. Finally, the percentages of 8th, 10th, and 12th grade students who report ever having experienced sexual assault are alarming. In 2018, 36 percent of 12th grade female students reported having been sexually assaulted. In addition, nearly one-third of 10th and 12th grade students report having witnessed sexual assault. In order to ensure students receive instruction about healthy relationships, sexual violence and coercion, and affirmative consent, OSPI proposed a bill that would require comprehensive sexual health education statewide. Many organizations, including the Centers for Disease Control and Prevention, have agreed that comprehensive sexual health education is an evidence-based strategy shown to reduce the risk of sexual violence. Students in grades 6, 8, 10, and 12 take the Healthy Youth Survey every two years, voluntarily answering a wide variety of questions about health behaviors from substance use to mental health and school climate. It is important to note the sexual health questions are included on an optional tear-off portion of the survey that is only provided to survey takers in grades 8, 10, and 12. In the fall of 2018, more than 230,000 students took part in the survey. The responses from about 32,000 of those students are used for the statewide sample, with remaining participation informing local results. The survey provides state and community organizations with information to help decide on which teen health issues to focus. The survey is a collaborative effort between the Office of Superintendent of Public Instruction (OSPI), the Health Care Authority (HCA), the Department of Health (DOH), and the Liquor and Cannabis Board (LCB). More information about the survey, including results and fact sheets, is located on the Healthy Youth Survey website.